ISBN 0634044591. 6x9 inches. The Lyric Library. 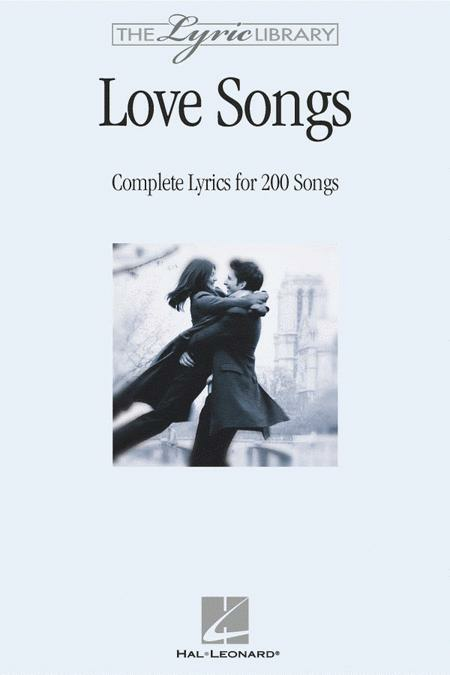 Lyrics to 200 of the most romantic songs of all time, including: All My Loving • Always in My Heart (Siempre En Mi Corazon) • And I Love Her • Anniversary Song • Beautiful in My Eyes • Call Me Irresponsible • Can You Feel the Love Tonight • Cheek to Cheek • (They Long to Be) Close to You • Could I Have This Dance • Dedicated to the One I Love • Don't Know Much • Dream a Little Dream of Me • Endless Love • Fields of Gold • For Once in My Life • Grow Old with Me • The Hawaiian Wedding Song (Ke Kali Nei Au) • Heart and Soul • Hello, Young Lovers • How Deep Is the Ocean (How High Is the Sky) • I Just Called to Say I Love You • I'll Be There • I've Got My Love to Keep Me Warm • Just the Way You Are • Longer • L-O-V-E • Love Will Keep Us Together • Misty • Moonlight in Vermont • More (Ti Guardero' Nel Cuore) • My Funny Valentine • My Heart Will Go on (Love Theme from 'Titanic') • She • Speak Softly, Love (Love Theme) • Till • A Time for Us (Love Theme) • Unchained Melody • Up Where We Belong • We've Only Just Begun • What the World Needs Now Is Love • When I Fall in Love • Witchcraft • Wonderful Tonight • You Are the Sunshine of My Life • You're the Inspiration • You've Made Me So Very Happy • and more! Tonight - From "West Side Story"